While sculpture was establishing a basic alteration in the way the human body was portrayed, painting was occupied with the question of how to relate form to space. For the first time, use was made of multiple seating levels for the forms. The intention was to convey depth, as yet without any perspective shortening. It was an innovation echoed in vase-painting - principally in the work of the Niobid Painter, but also by a whole host of vase-painters working in the middle years of the 5th century. 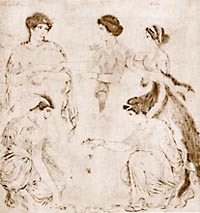 The most famous painter of the time was Polygnotus from Thasos, with whose name the discovery of perspective is particularly associated. As we know from Pausanias, Polygnotus embellished the Lesche of the Knidians at Delphi with a pair of compositions, probably both done on assembled wooden frames. One was of the Fall of Troy, the other of Odysseus' descent to Hades. From Pliny we know that Polygnotus was the first painter to portray figures frowning and with their mouths open - thus laying emphasis on their expressivity. This may be why Polygnotus was, for centuries afterward, regarded as the father of painting. Aristotle, too, spoke enthusiastically of Polygnotus, describing him as "a fine portrayer of ethos". Polygnotus' main rival was his Athenian contemporary Micon, who is best known for his picture of the Battle of Marathon, in the Painted Stoa at Athens. Some of the sources attribute this picture to Mikon's near-contemporary Panaenus, however. It portrayed people well-known to the Athenians of the time: Miltiades, Callimachus, Cynegirus, Datis, Artaphernes. Unfortunately our ancient sources are often all too terse. We get no information about painters such as Plistaenetus and Panaenus - Phidias' brother and nephew respectively - and Euripides the poet, other than their bare names. Some of the new elements introduced into painting in the Parthenon years can be seen on pots by the Achilles Painter and the Phiale Painter: doors and buildings are depicted with perspective foreshortening, showing the painter's desire to express three-dimensional space. Elements of this kind will have been developed in the work of Agatharchus from Samos. Apollodorus the Athenian, who was working towards the end of the 5th century, was, according to Plutarch, the first painter to discover how to use light and shade to bring out plasticity of form. This was a problem in theory that also engaged Zeuxis, from Heraclea in Pontus - the painter of whom Lucian said that he was "a superb artist, but a real weirdo". His portrait subjects included Helen of Troy; Alcmene and Zeus; Heracles as a baby; and Marsyas in chains. He also famously worked for king Archelaus of Macedonia. Zeuxis' great rival was Parrhasius from Ephesus, who relied exclusively on line to convey volume - a technique familiar to us from the white-ground lekythos. Sometimes, apparently, Parrhasius joined forces with leading toreuts to design vases of metal embellished with compositions with several figures. Note: Click on the icons for enlargements and explanations. Underlined links lead to related texts; those not underlined ones are an explanatory glossary.